Law Offices of Bing I. Bush, Jr., A Professional Corporation. About Bing I. Bush Jr., A.P.C. Bing I. Bush, Jr. was raised in Lexington, KY where he grew up with horses from a young age. From 4-H, Pony Club, Hunter & Jumper Shows, Bing went on to break yearlings at local Lexington horse farms and gallop thoroughbreds at the racetrack. He also has trained racehorses (nothing like Bob Baffert! ), and worked in numerous phases of the horse business. HorseLawyers.com a leading internet resource regarding how the law is applied to all aspects of the equine industry, you may access his site using the weblink below. After completing classes at University of Kentucky Law School (Juris Doctorate) in Kentucky and Cambridge University, in Cambridge England (international law), Bing moved to California where he began his legal career. First with a large insurance defense firm, Hollywood & Neil, Bing soon moved to another general civil litigation firm where he eventually became a partner at Mullen, Plummer, Badger & Bush, APC. During his 10 years plus with that firm, Bing was actively involved in numerous, major litigation cases. He sold his partnership interest back to the firm however in order to open an office in Lexington, Kentucky and dedicate even more of his law practice to equine-related matters.Today, Bing and his family share time in their primary home in Del Mar, California and their home in Lexington, Kentucky. The Law Offices of Bing I. Bush, Jr., A.P.C. represents clients in all equine transactional and litigation matters both nationally and internationally. It provides legal services to owners, trainers, jockeys and others before the Stewards of Racing Boards, State and Federal Courts in both financial and contractual disputes, equine insurance issues, equine related liability and personal injury disputes, and employment issues. Furthermore, the Law Offices of Bing I. Bush, Jr. specializes in the formation of partnerships, LLC'S, LLP'S, C-Corporations, S-Corporations, and syndications with tax and estate planning considerations. Is It True That Bing Was Selected As Executive Director of The 2017 Breeder's Cup? Yes! Says Bing, The World Championship Breeders' Cup is coming to Del Mar Race Track for the first time on November 3 & 4, 2017. I am deeply honored to be selected to serve as the Executive Director of the Breeders' Cup Host Committee. As this event covers 2 days of racing, $30,000,000.00 in purses, attracts competitors from literally around the world, the economic impact for the Host Community and surrounding area is estimated to be over $75,000,000.00. Accordingly, I will be working with the Breeders' Cup Ltd, Del Mar Thoroughbred Club, San Diego Sports Alliance and others to create a series of events and projects to make the 2017 Breeders' Cup Week into the most memorable experience possible. What Services Are Offered by The Law Offices Of Bing I. Bush Jr., A.P.C.? The Law Offices of Bing I. Bush, Jr., A.P.C. offers a wide range of legal services to any client involved in the equine industry. Unlike many firms, we focus on the equine industry and understand the complex issues relating to the following areas. Cases are taken on an hourly basis, project basis, or contingency basis depending upon each client's individual needs and the nature of the work involved. Does Bing Have Published Articles? Yes! Bing has published various articles concerning equine liability issues and has given seminars for various equine organizations on numerous legal issues confronting horse owners, trainers, and others. Bing is a member of numerous horse organizations and legal Organizations in California and Kentucky. Bing's toll free office number 800-745-9336, will put you in contact with either of his offices. Bing has the expertise and the experience you need; he would be delighted to make an appointment with you. Don't Forget Our 2nd Office Located in Beautiful Lexinton, Kentucky! Law Offices of Bing I. Bush Jr., A.P.C. Contact The Law Offices Of Bing I. Bush Jr., A.P.C. Today! 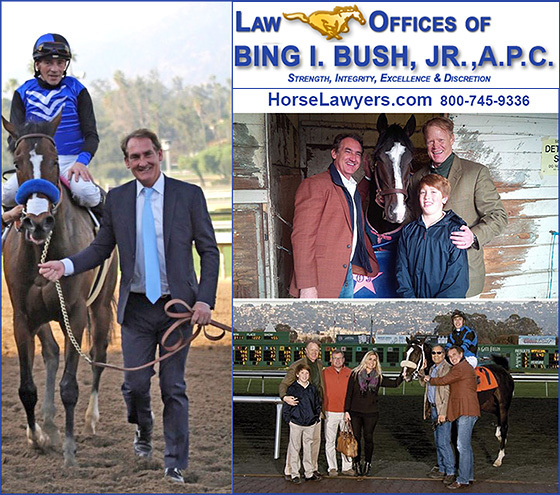 If you are in a horse business, or threatened with a lawsuit, or even need to file a lawsuit, the Law Offices of Bing I. Bush, Jr, A.P.C. is the only place you need to call. As an experienced horse owner himself, and acquainted with all areas of equine law and business, Bing I. Bush Jr., A.P.C. is here to serve your needs and protect your best interests. Call Bing today or visit horselawyers.com! Contact: Bing I. Bush, Jr., A.P.C.